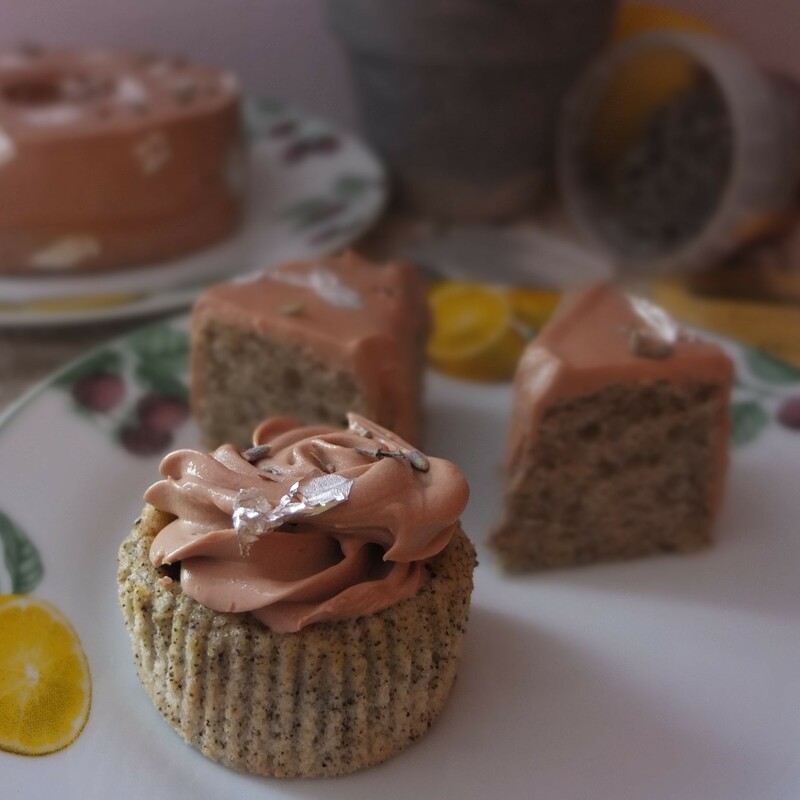 Earl Grey tea, lemon and lavender chiffon mini cakes and cupcakes recipe! With chocolate lavender buttercream! 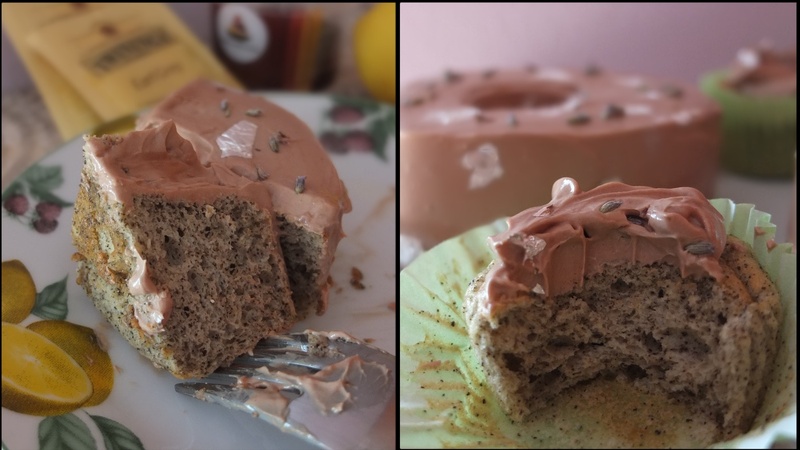 Glutenfree, low sugar… and what’s a chiffon cake?! And here it is with no buttercream so the citrus flavour is highlighted. Easier and healthier but also very yummy! So what’s a chiffon cake? Wikipedia states ‘a chiffon cake is a very light cake made with vegetable oil, eggs, sugar, baking powder and flavourings… it’s a cross between an oil cake and a sponge cake.’ Apparently it was invented in 1927 by Harry Baker, a Californian insurance salesman turned caterer! Yes, there’s hope for us all. 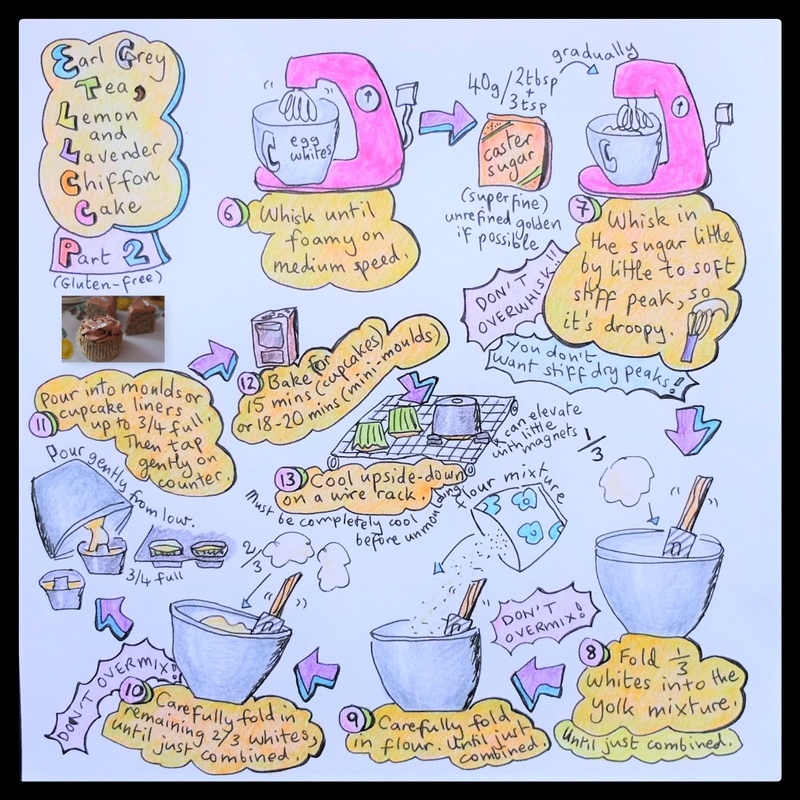 🙂 After 20 years keeping the recipe secret (he obviously wasn’t a blogger), Baker finally sold it to General Mills so the chiffon cake was marketed and became popular around the 1940s and 50s. Now I’m not a chiffon cake expert, having made it four times with a focus on fluffiness and flavour so you can see in the photo above the naughty big holes that shouldn’t be there!!!! Holey cake batman! I forgot to tap the tins lightly before putting in the oven! And holes appear even bigger on mini cakes! Oops. But even with holeitis the cakes are delicious and much better than heavy or dense. Use chiffon tube moulds for best results and don’t grease them. Be precise with measurements (a digital weighing scale helps). 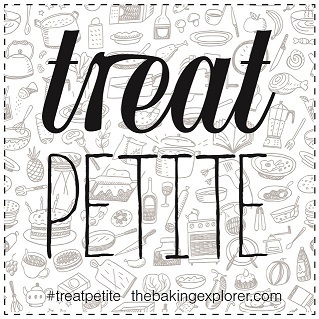 Don’t overwhisk the whites – make sure they say at soft stiff peak (with a droop). Don’t overfold your whites or the mixture will flatten and become dense. Pour gently into the tins. Tap the tins lightly on the counter (kind of worked for me, but will try tapping the bowl instead next time just before pouring). 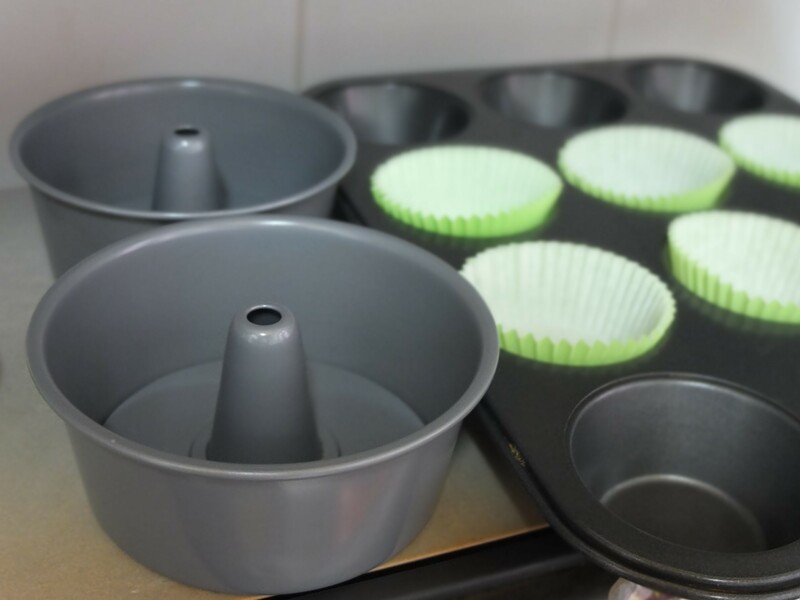 Once out of the oven immediately turn the moulds or cupcakes upside-down to cool on a wire rack, elevated if possible with air passing under to avoid condensation. 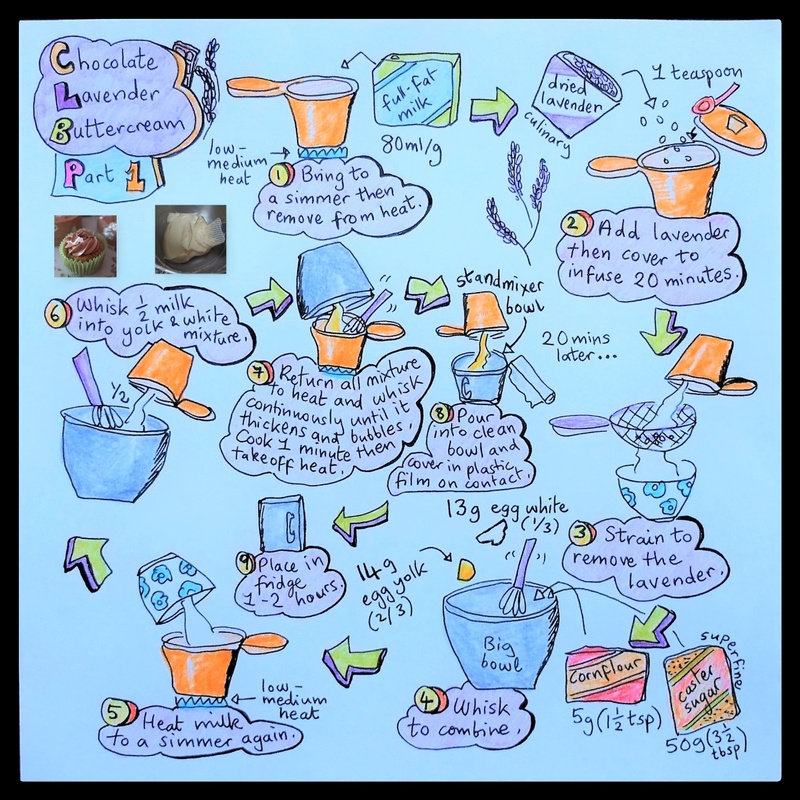 Even if you forget tips 3, 5 or 6 your cakes will be yummy. But remember not to grease, don’t overfold and cool upside-down, otherwise your cakes start collapsing. 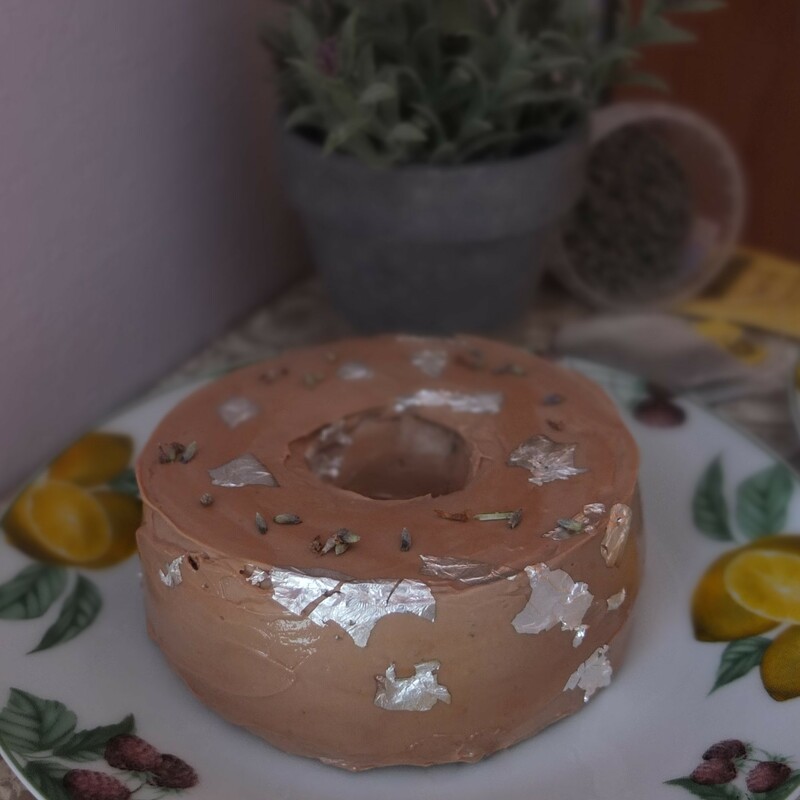 My creations are based on the mixed spice chiffon cake in Chef Yamashita’s book Tanoshii Ke-Ki but changing the quantities, flavourings and buttercream. Also I’ve used self-raising glutenfree flour instead of plain flour. 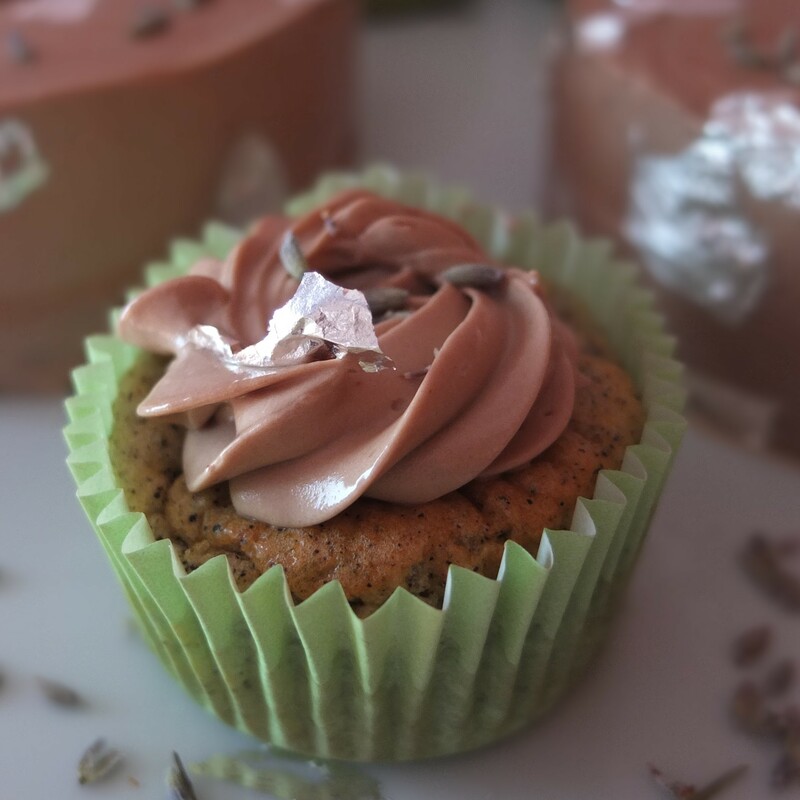 The buttercream’s slightly adapted from Sift and Whisk’s Chocolate Lavender Frosting, containing a little more chocolate, melted on a bain marie not in a microwave. First make the buttercream (2 mins work, 20 mins infusing, 8 mins work, 1-2 hours cooling in fridge then 10 mins work); chiffon (30 mins work, baking 15-20 mins, cooling 1-2 hours). Decoration: 10-20 mins, 30 mins chilling. DON’T GREASE YOUR TINS!!! 🙂 Chiffon cakes don’t appreciate it. 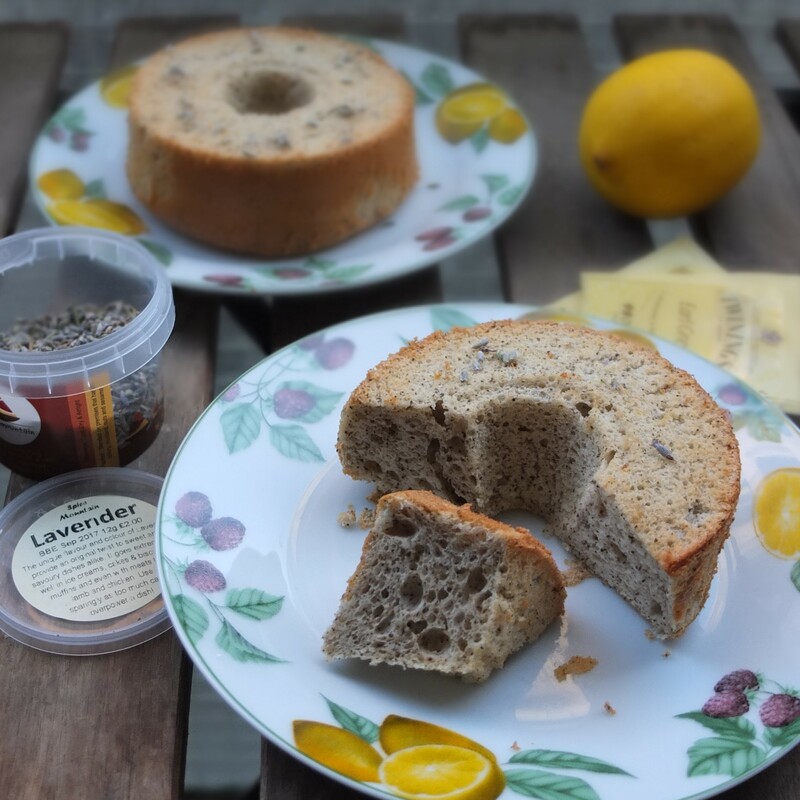 Grind the Earl Grey tea powder and lavender together to a fine powder. In a small-medium bowl whisk to combine the dry ingredients (flour, baking powder, cornflour, Earl grey and lavender, salt). Separate your eggs, placing your yolks in a big bowl and the whites in a standmixer bowl or other big bowl. Make sure there’s no yolk at all in the whites and that the bowl is very clean (any grease or dirt will prevent the whites from rising well). Whisk the yolks, sugar (36g) and lemon zest until the mixture is pale and creamy. This can take 10-15 minutes by hand. Whisk in the lemon juice then slowly stir in the olive oil with the whisk, till just combined. Slowly stir in the milk till just combined. The mixture will be quite liquid now. Whisk the whites till foamy on a medium-high speed then gradually add the sugar (40g). Whisk to soft stiff peak so the mixture doesn’t stand up straight on the whisk but droops a little. 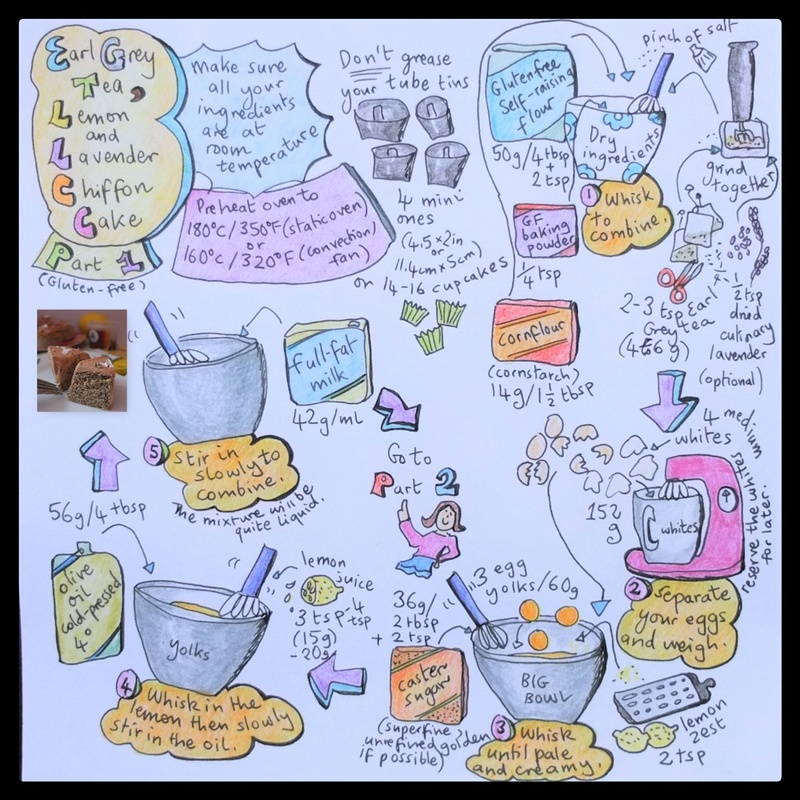 On a standmixer it can overwhisk really fast (in just a minute!) 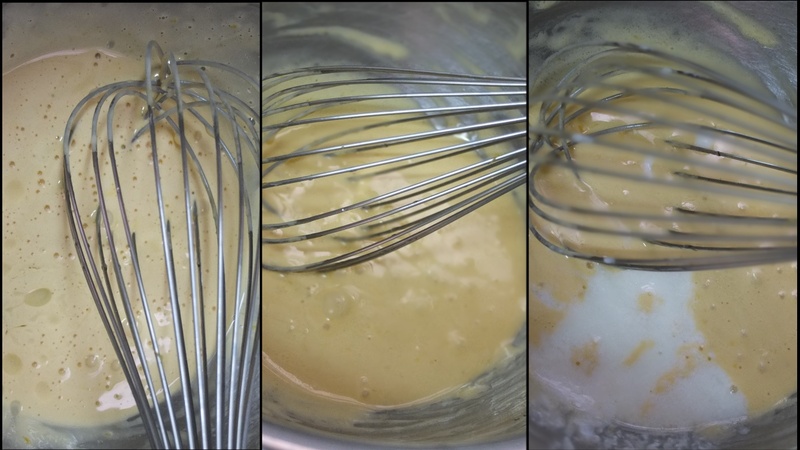 so you have to be careful – it’s a good idea to take the bowl off the stand early and finish whisking by hand. Carefully fold 1/3 of the whites into the yolk mixture with figure of eight motions until just combined. Don’t overmix. Carefully fold in the flour mixture till almost combined. Again, don’t overmix. Carefully fold in the remaining 2/3 of whites till just combined. As usual don’t overmix or it flattens out but make sure there are no white lumps or streaks. 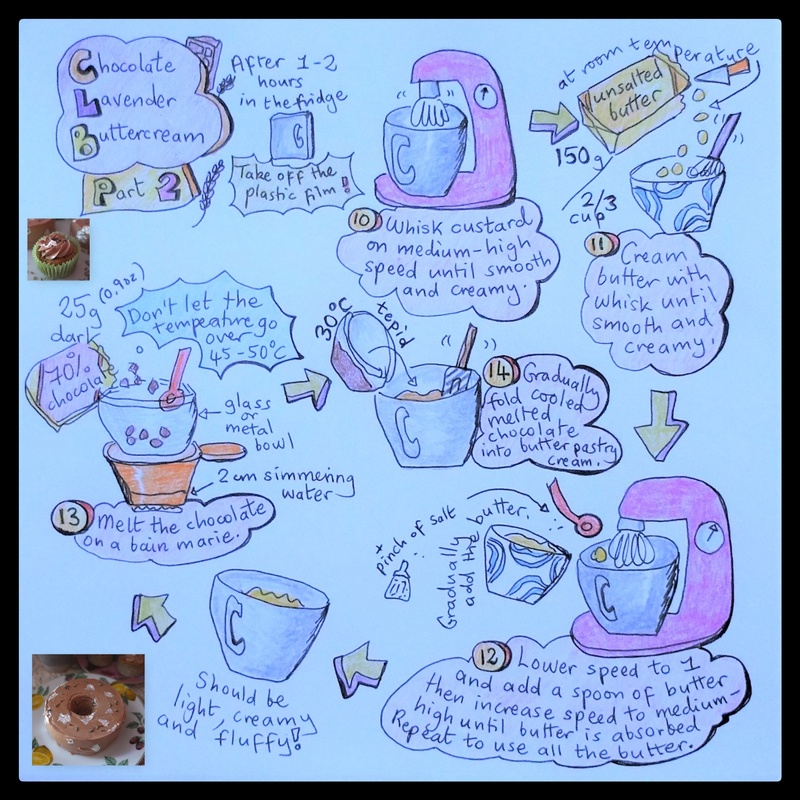 Keeping the bowl low and close pour gently into the moulds or cupcake liners (placed in a muffin tin). This is to avoid extra air and bubbles. Tap the tins gently on the counter. Bake in the middle of the oven. 15-16 minutes for cupcakes and 18-20 minutes for the mini moulds. Bake until light brown and an inserted skewer comes out clean. 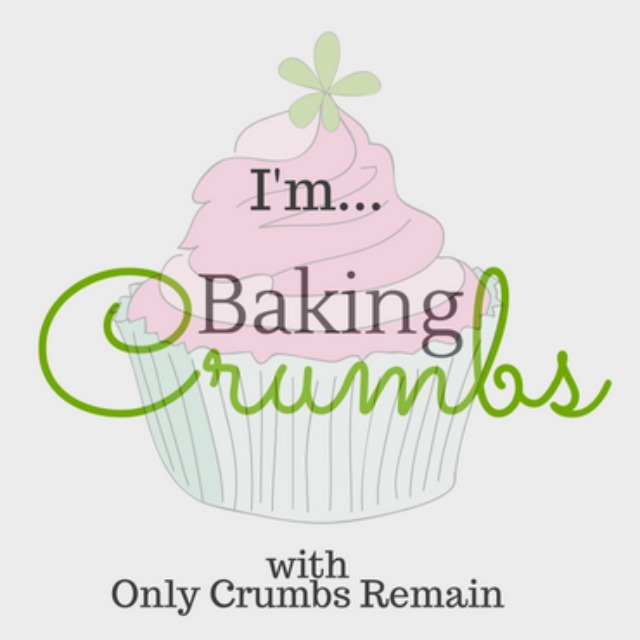 It’s important the temperature remain stable in the oven – don’t open the oven door for the first 15 minutes (cupcakes) or 18 minutes (mini chiffons). When ready immediately place upside-down on a wire rack to cool. If the mini chiffons can be elevated a little even better. Cool completely for 1-2 hours before unmoulding. Slide a knife around the edges and underneath to help the cakes come out. Don’t worry if they’re not completely smooth, especially if you’re covering in buttercream. The buttercream should be soft enough to spread but stiff enough to hold. If too soft chill a little longer in the fridge; if too stiff allow to soften at room temperature. For the cupcakes you can use a Wilton 2D piping nozzle to make swirls that almost look like roses. You don’t need a lot of buttercream on top and could have less than shown in the photo. For mini chiffon cakes use a small offset spatula to first spread a very thin ‘crumb’ layer around the cake. Chill in the fridge till firm then spread a thicker layer over the cakes. The mini chiffons are perfect with a thin layer of buttercream. 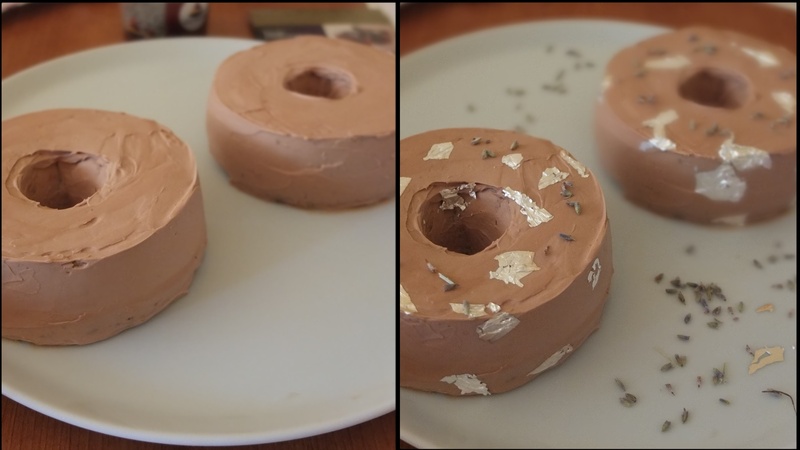 Optional: use tweezers to carefully place pieces of edible silver paper artistically on your cakes then sprinkle a little lavender. 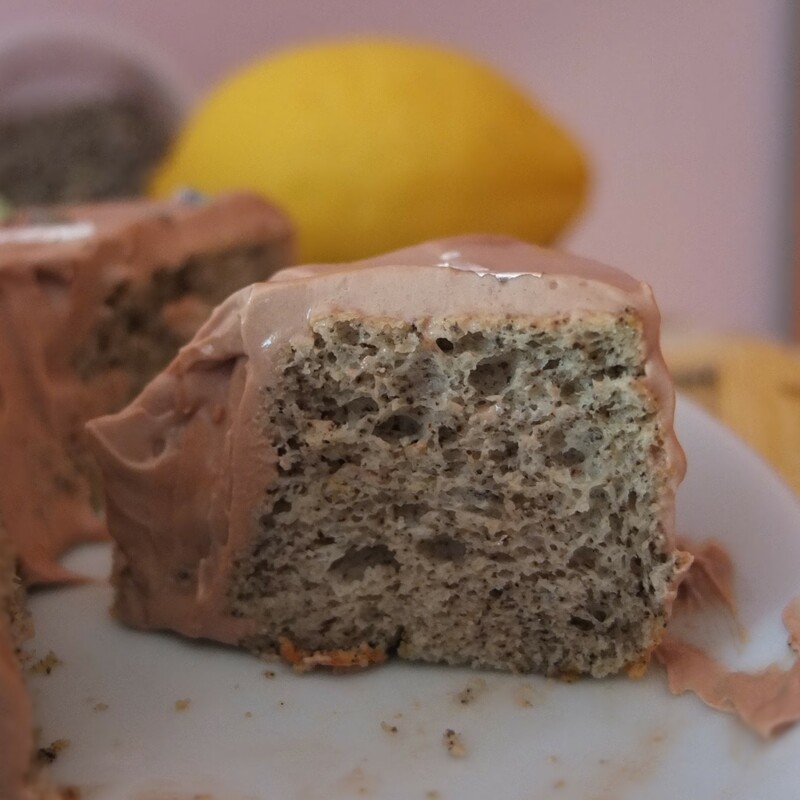 These cakes store perfectly in the fridge in airtight tupperware, up to 4-5 days. To eat, remove from fridge and leave at room temperature for around 30 minutes so the buttercream softens and becomes creamy again. Apparently chiffon sponge (without the buttercream) freezes really well, wrapped tightly in plastic film. 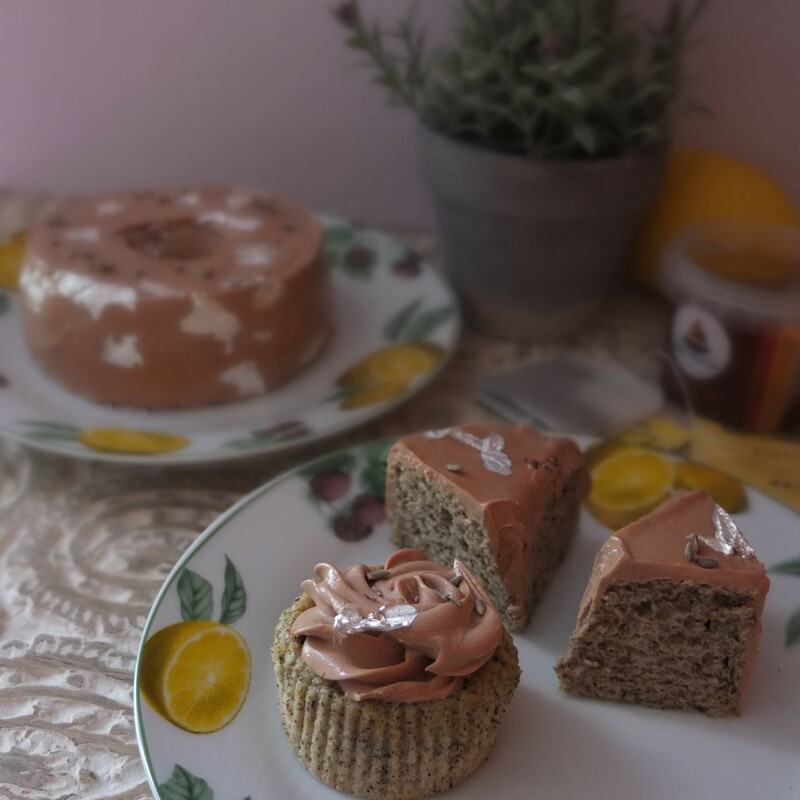 These cakes are really delicious with soft creamy frosting which is delicate and has a very light chocolate taste that doesn’t interfere with the Earl Grey, the star of the show. 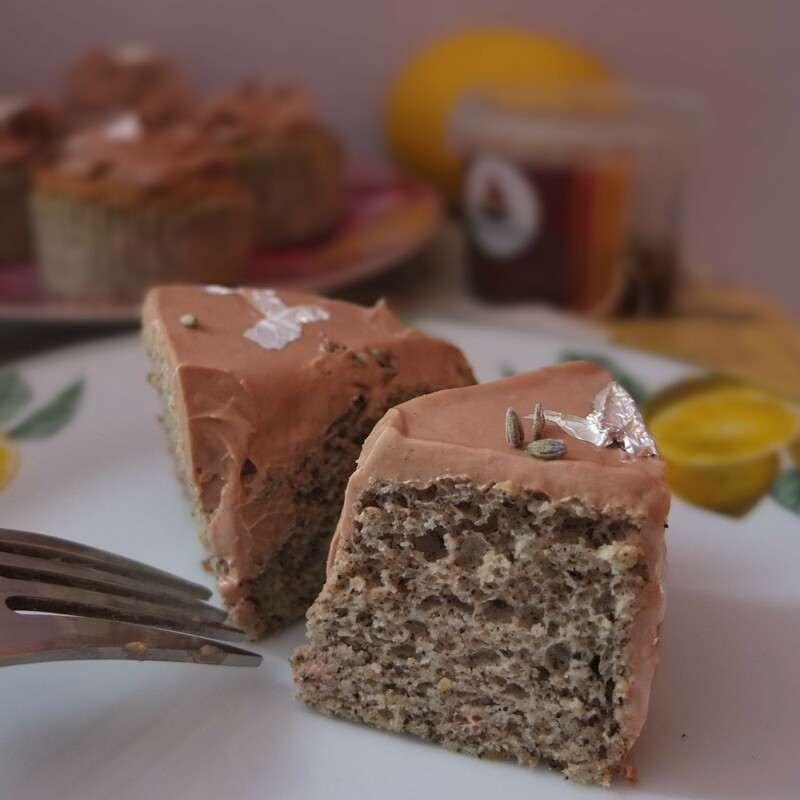 In fact eating these light moist cakes is like partaking of a cup of milky Earl Grey tea with the lemon and lavender adding their special subtle touch. 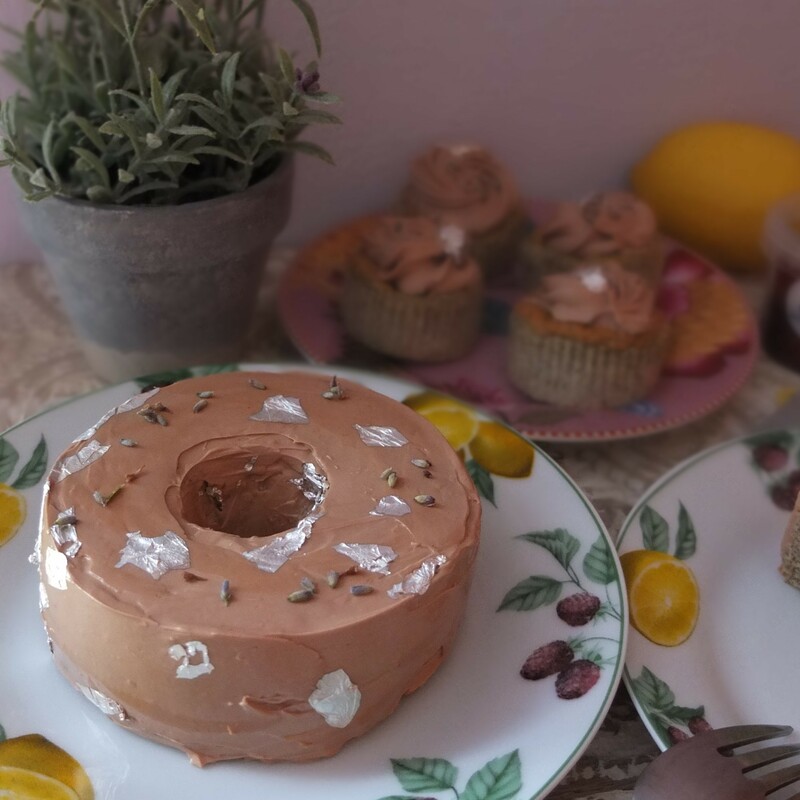 Just going to share these cakes with a couple of parties where you can see loads of lovely recipes: Treate Petite hosted by the Baking Explorer and I’m baking… crumbs at Only Crumbs Remain. 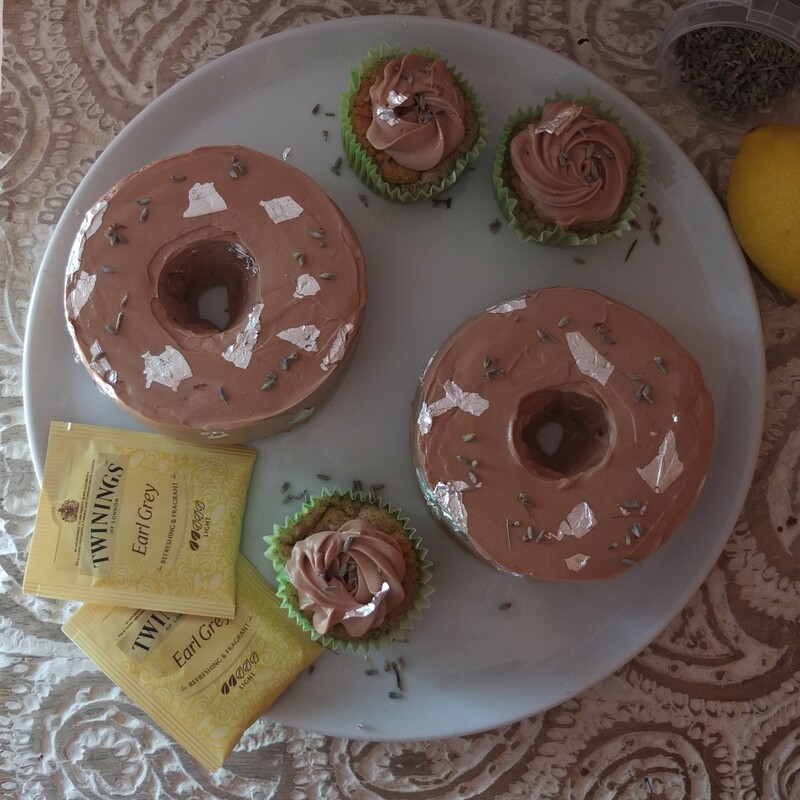 You’re all invited to try some Earl Grey tea, lemon and lavender mini chiffon cake or a cupcake! I think you’d enjoy it.